My big project this week has been the kitchen. I have wanted to do a major cleaning for a while now, and it’s as good a time as any. This also gives me a chance to do some reorganizing since I have a good idea now of what new kitchen items (I mean post-wedding) get used more often than others. So my electric griddle gets put somewhere that makes it easier to use, for example. The clam boil pot, as much as I love it, might get used once or twice a year and so it can go somewhere out of the way. Anyway, as I was cleaning yesterday Scratch decided he was going to “help” by heading up to his new cat bed, up on the freezer. Now, before I get into this too deeply, some background is required. When Kelly and I first moved into our current apartment (almost 5 years ago), we did a lot of looking on Craigslist to find furniture we needed. Mostly bookcases, but we also went looking for a couple of new appliances. My old wine cellar fridge was not really working well anymore and we also wanted a freezer of some sort. So we managed to find an upright freezer whose owners just wanted it gone. They didn’t even want money for it. They just said “if you can get it out of the basement and take it away, it’s yours”. So Kelly and I brought the truck and a dolly and managed to get the freezer loaded into the truck. It was an older commercial model that could lock, but was in perfect working order. So when we got it back here, we did some rearranging in the kitchen and got the freezer put in. And it is so ridiculously handy to have. We buy a lot of things in bulk at Costco, and we have lots of space to store it. Plus there is lots of room for the frozen Trader Joe’s dinners that Kelly loves to take to work with her. It didn’t take long for the cats to discover this new high perch in the kitchen, one which had a large open platform on which to sit. And it afforded a view of the whole kitchen, plus parts of the dining room and living room as well. So once the cats decided they loved the spot, we figured we would let them use it that way. 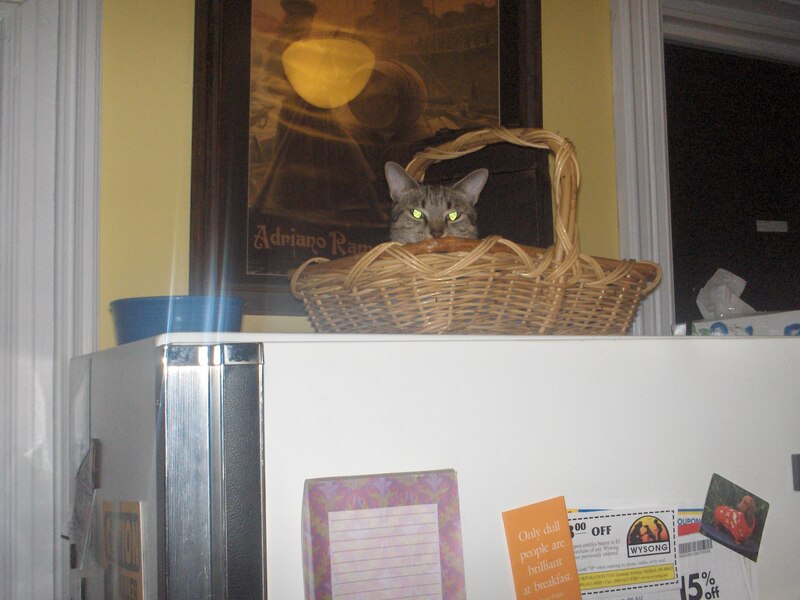 We found an old basket, and put an old towel in it to make it a little softer and warmer. And that quickly became Bucky’s favorite napping spot, at least upstairs. Note the food bowl in the lower left corner of the photo. Bucky likes that spot so much that we started feeding him up there too, since it keeps his food away from the dogs. And all seemed great. Until Scratch discovered he liked that spot too. Our cute little terror, enjoying Bucky’s bed. Now, most of the time this isn’t too much of a problem, because in the summertime Scratch tends to sleep in his hammock, and in winter he sleeps with us at night. So the only time this really became a problem was during the day in the winter, when sometimes Scratch would challenge Bucky for the bed. Bucky always won. But as Bucky gets older, fighting with Scratch is not on his list of priorities. So he just stopped using the bed, which made us a little sad. It is a great spot, and we figured if we managed to put another decent cat bed together, we might get both of them up there and they wouldn’t have to fight. 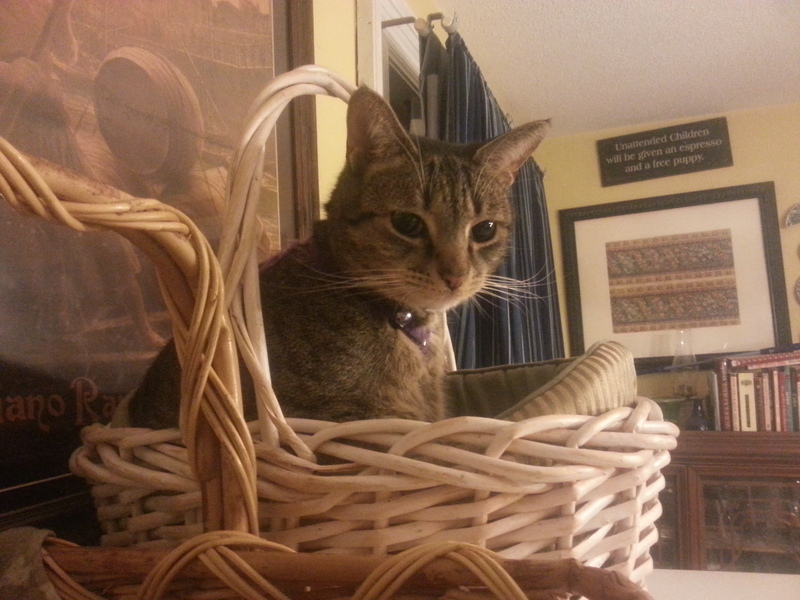 So Kelly managed to find another basket for free somewhere, and I cleaned up an old pet bed to put inside the basket. And amazingly, Scratch loves it. 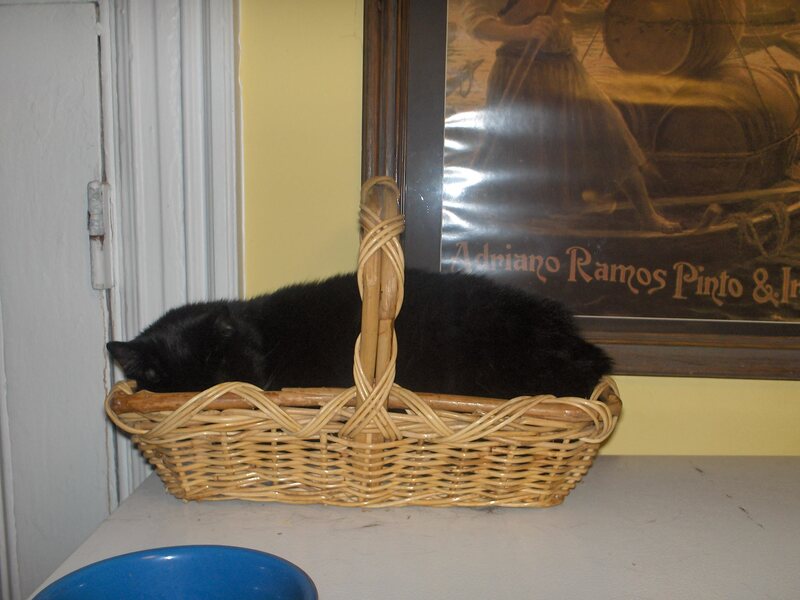 Old pet bed + free basket = comfy kitteh. Now I just have to try to get a picture when both of them are in their beds.